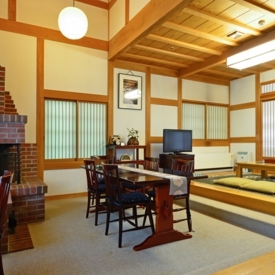 The sunken hearth is one of the charms of Hoshi Onsen. Life with a sunken hearth is rare in modern times. 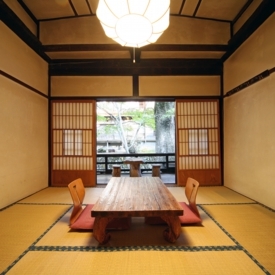 Hoshi’s sunken hearth is a place for communication among its guests. It is on the left-hand side near the entrance. Firewood is burning with a crisp sound all year long. The hot water in the teakettle is boiling and steaming, and the kettle lid rattles to make a chorus. Hearing this sound, guests are gathering little by little. Smiles and conversations of strangers naturally start. Please have some tea from the iron kettle. 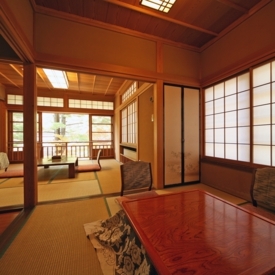 Experiencing the old life of a mountain village will be one of your memories of Hoshi. There is an atrium entrance after going up the concrete floor. 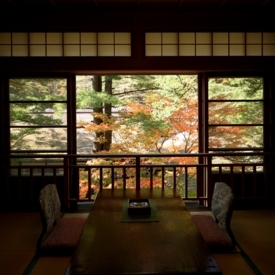 It is a traditional facility with a collection of calligraphic works of poets of the Meiji period and household Shinto altars. The area is redecorated in every season such as New Year’s Day and Lesser New Year's Day. A heavy masterpiece is lying down. Please take a close look. 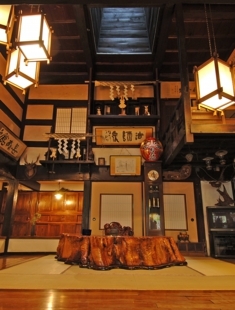 The oldest guest room building at Chojukan, which is designated as a national registered tangible cultural property. None of the rooms have bathrooms and vary in size. 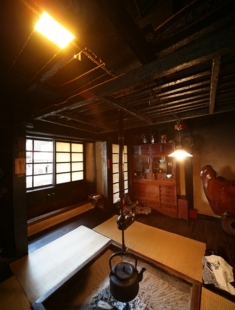 The room used to be used by many writers and artists is still maintained. 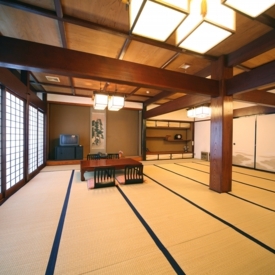 It is the same room, but gives a different impression from different angles. A cool breeze comes in from the courtyard. No air-conditioner is needed in the summer. 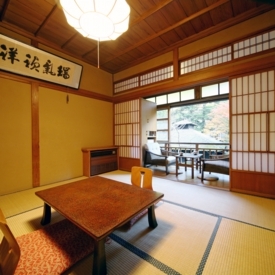 A guest room building designated as a national registered tangible cultural property. 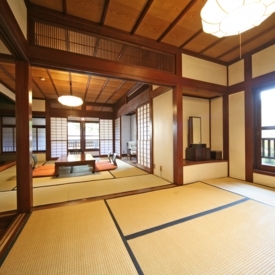 It was constructed in 1940 on the Hoshi River side, and the river can be viewed from all rooms. 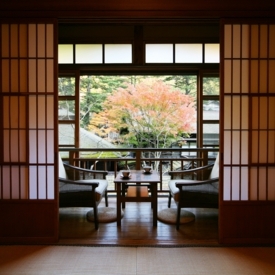 The elegance of the old time remains unchanged. All rooms have bathrooms. 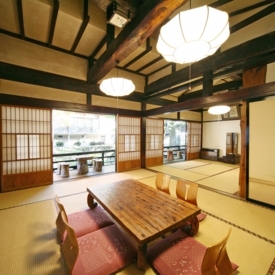 From this room, the main building and Hoshi No Yu can be viewed on the Hoshi River side. 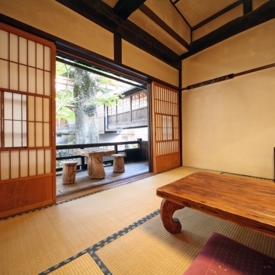 This is a quiet room where the courtyard can be viewed. 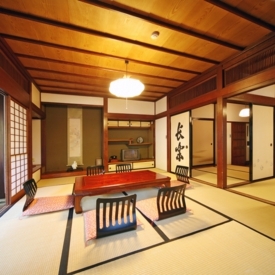 It is a two-story wooden building constructed on the Hoshi River side In 1978. 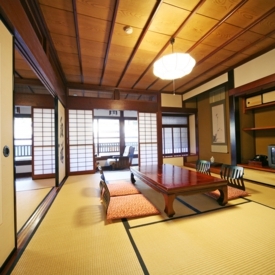 With the profound interior, each room has a slightly different floor plan and atmosphere. Specify a room in Kunzanso if you prefer a superior room. Horyuden is a wooden two-story structure rebuilt in 1989. 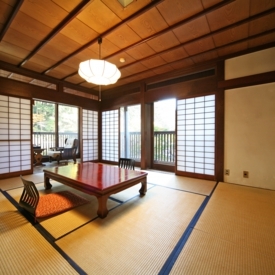 Each unit has an 8-jo and 4.5-jo rooms, an entrance space, and a sunken kotatsu. The floor plan and construction materials were carefully determined. 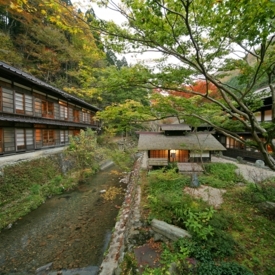 The building is located on a somewhat higher ground where the guests can enjoy wild birds singing in the morning. 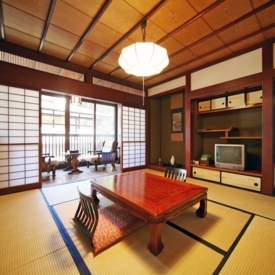 Specify a room in Horyuden if you prefer a superior room.